The objective of this study was to investigate the limits concerning possible reduction of lubricant quantity in gears that could be tolerated without detrimental effects on their load carrying capacity. The complete Product News section from the May 2011 issue of Gear Technology. The complete Technical Calendar from the May 2011 issue of Gear Technology. 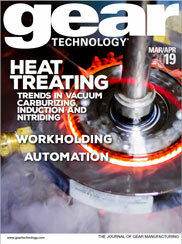 The complete Industry News section from the May 2011 issue of Gear Technology. The opposed-piston internal combustion engine is making a comeback.